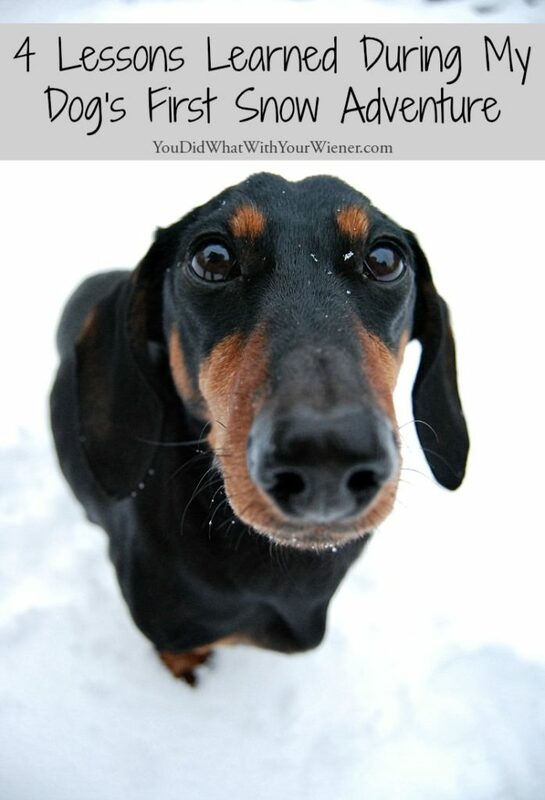 Please welcome Elena and her Dachshund Moo to the blog. I introduced her in our 6-year anniversary blog post the other day . She’s been helping me out and will now be sharing her own articles, and experiences, here. Being from the South, Moo’s exposure to snow is minimal… very, very minimal. There was once a few years back when a light dusting of snow covered the ground in the town I grew up in, and I remember eagerly snapping a few photos of Moo for her “first snow experience”. Looking back, it gives me a good laugh. As Washington implants, Moo and I both have a lot of catching up to do in regards to snow adventures. Moo’s the type of dog that will go running into a lake after a tennis ball, but avoids wet grass as if it’s boiling lava, so I really wasn’t sure what she would think of fresh snowfall. With snow dumping all over Western Washington this last week, it seemed like the right time to head to the mountains. We met up with Jessica (because hey, who better to adventure and learn from than this awesome woman), and set out for Franklin Falls in Snoqualmie Pass. I don’t know if it’s just me, but I feel like dog boots have become increasingly popular in the last year. Maybe they always have been and I’ve just been in the dark, but either way, they’re cute and I love the protection they can provide for our dog’s paw pads against the rough surfaces in the outdoors. That being said, Moo has stubbornly put all four paws down against them, and refuses to walk in them. Snow boots were sadly a no-go for us, so my main concern about out hike was that the snow would be painfully cold on her paws. Overall, she managed fine and never showed any signs of being uncomfortable, but looking back I feel like there are a few preventative “paw preparations” that I should undertake in the future, especially if we go on a longer, more rigorous hike next time. The three big concerns with canine snow hiking is that ice balls can form and get stuck in between their toes and, they can get frostbite, and the abrasive snow can scratch their paw pads. Ice balls can be prevented by both trimming the hair between your dog’s toes, as well as making sure their toenails are clipped so that their toes don’t spread. Moo doesn’t have much hair in between her toes so that’s not an issue for us, but her toenails grow mind-blowingly fast. I typically get them cut every two weeks, but even that doesn’t seem like enough sometimes. Next time we go on a hike, I’ll make sure to get her toenails cut prior in order to minimize the risk. I help make sure Moo isn’t going to get frostbite by stopping periodically to feel if her feet are warm or cold. Since dogs lose heat through their feet, I know that if I keep her body super warm her feet are usually fine too. In regards to the rough snow scraping your dog’s feet, there are a few preventative measures that can be taken. If you walk your dog regularly on hard surfaces, their paw pads will thicken, kind of like a callous on your own feet. Moo gets plenty of paw-strengthening walks (although I’m finding it a tad more difficult than Texas because the rain and cold here). Some people also put boots on their dog. Since boots are out of the picture for Moo, I go a different route there. I apply a paw balm to her feet to act as a barrier against the elements and keep her paw pads soft and supple. The paw balm that I’m currently using is Protex Pawz Wax. Like most paw wax, it’s designed to protect against snow build up, salt burn, and cracked paws. I know Jessica prefers to use Musher’s Secret, which was made to protect the feet of sled dogs. 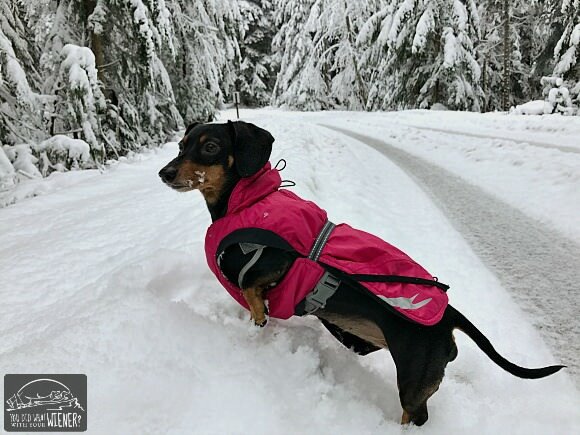 As of late, Moo has been rocking Hurtta’s Summit Parka, which I wrote a review on last week. I love this jacket and it worked flawlessly keeping Moo warm and dry during a rainy hike we went on a few weeks back. She wore it on our snow hike as well, and at no point was she shivering. Honestly, she was so pumped to be in the snow I don’t think she willingly stopped running around and jumping long enough to even be cold. She could easily wear this jacket the rest of the winter and be just fine. That being said, Gretel was rocking the Hurtta Extreme Warmer jacket on this hike and she was dressed for success in the snow. Both jackets are great, but the Extreme Warmer seems to be specially designed for snow adventures and challenging conditions. This jacket offers more overall body coverage, with a reflective foil on the inside to reflect a dog’s body heat. Also, it has a hood that can be pulled out of the collar area to cover a dog’s ears and it’s possibly the cutest thing I’ve ever seen. This jacket is just incredibly snug and toasty. Like I said before, Moo’s Parka worked just fine, but it seems to be better designed for a rainy winter day than snow hiking and blizzard conditions. It’s okay to have a jacket for every weather condition, right? I’ll be honest, a seat pad and blanket never even crossed my mind when Moo and I headed out for this hike. I packed Moo and I some water, food, jackets, doggie bags and “just in case” snow shoes for myself. If any of you have hiked, or ever have the pleasure of hiking with Jessica, you will know that she comes to every outdoor adventure with enough gear to cover not only herself, but anyone else she’s hiking with as well… for a week. Haha, kidding, but she really is the most prepared hiker I’ve ever hit the trails with. It’s impressive. When we got to the end of the trail, the dumping snow paired with the wind from the waterfall created some pretty chaotic blizzard-type conditions. This is where we wanted to stop to take some pictures, which meant Gretel and Moo sat around for a bit while we snapped a few photos. 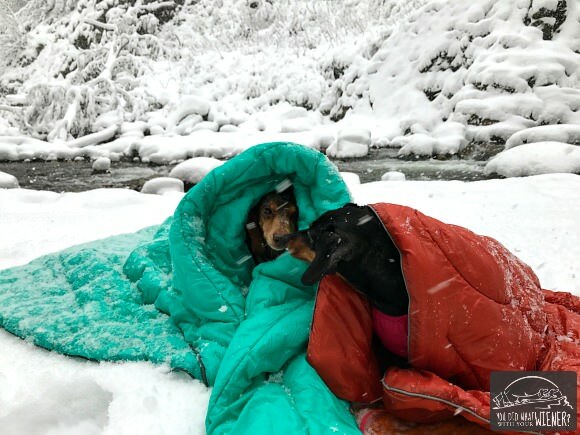 You can imagine it was pretty cold, and luckily Jessica brought actual seat pads and blankets for both Moo and Gretel to stay bundled and warm. They welcomed the shelter and relief from the snow underneath and all around them. The blankets that Jessica used were from Rumpl, which is a great brand known for their warm and waterproof outdoor blankets. Like I said, I didn’t’ even think about how cold it might be for Moo during the “stop and appreciate the view” time at the final destination of a hike. I’m grateful that Jessica came prepared so that Moo and Gretel didn’t have to sit and wait without any protection from the elements. 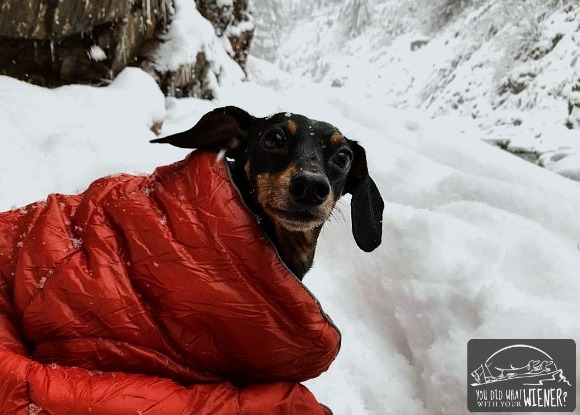 There’s absolutely no reason why a small dog can’t get out and snow hike, but it is important to make some informed decisions when picking your location, especially if your dog is a beginner. Franklin Falls was an awesome first snow experience because it’s short and a popular trail, which means the snow was pretty well packed down. That being said, it was snowing when we were there, so there was a little extra powder. When your dog is only a few inches tall, jumping through fresh, deep snow gets exhausting fast. There were a few times when Moo veered off the path to deeper snow, and while she was having a blast leaping and bounding forward, she wore out pretty quickly. Even though Franklin Falls is only two miles roundtrip (a distance that would typically be easy for Moo), she happily napped the rest of the day. When it comes to picking snow hikes in the future, I’ll make sure to continue sticking with popular trails that don’t have super deep snow. Also, I’ve learned that it’s a process getting your dog in snow-hiking shape. I’ve seen Moo sprint after a tennis ball for hours and not be as worn out as she was after our Franklin Falls hike. It’s a different type of workout, and therefore a gradual progression into longer hikes is probably a good idea. Perhaps later in the season we’ll go snowshoeing and opt for a less popular trail, but for now the short and packed down hikes are right up our alley. In summary, Moo loved every second of our hike, and has proven to me that she is her happiest self when she’s outdoors, sun rain or snow. Also, sidenote: I didn’t think it was possible for Moo to be more adorable in my eyes, until I saw her romping around in Washington’s snowy mountainside, tail wagging and snow in her whiskers. My heart melted, y’all, and I now believe that every adoring dog owner should experience this for themselves. If you’re thinking about taking your small dog snow hiking this winter, I wholeheartedly encourage it. I already can’t wait to hit the trails again, and know that I will now be better prepared for our next outing. I’m glad Moo had such a positive first snow experience! Both of my pups are Abominable Snow Pups, so they are big fans of spending as much time as possible in as much snow as possible. Sounds like you’re even more prepared for future snow adventures now! My silky Pr TrudyAnn LOVES LOVES LOVES the snow, just like her pawrents!! Sounds like a fun outing for ‘effuryone.’ Living in Colorado I had to get snow boots for my dogs and believe me they were not happy about it. Even years later they still act like they’re being tortured but have learned to navigate well in them. Because I have Standard Poodles who do have lots of hair between their toes, it’s a practical god-send to have the boots on. Best wishes for more hikes and future trails.